Today’s the day! I-Drive 360, home of The Orlando Eye, is officially open to the public. 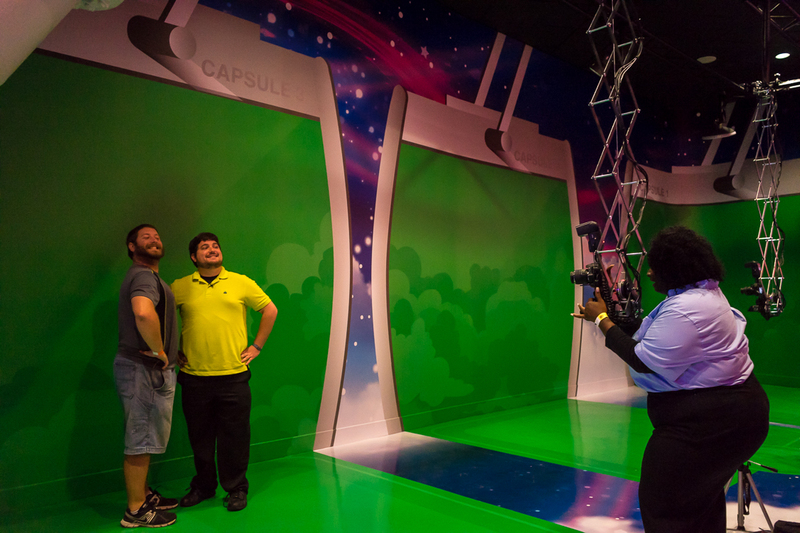 Last week, Orlando Informer was on hand to experience The Eye. Today, we have everything you need to know about the attraction before you and your family “take flight” on an upcoming vacation. A look at the 400-foot wheel from the bottom. Prior to boarding, you’ll need to purchase a ticket to ride. Discounts are offered for purchasing online in advanced and for purchasing combination tickets, so it’s important you choose the right ticket for you and your family. No matter which ticket you choose, parking is free at I-Drive 360. The observation wheel is open Monday – Friday 10am – 10pm and Saturday / Sunday 10am – 12am. Individual tickets for any day: $25 for adults and $20 for children age 4 to 12. No online discount available. 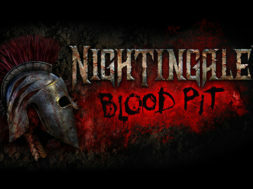 Individual tickets for scheduled date and time: $18 for adults and $13 for children age 4 to 12, when purchased online. VIP Experience: With this ticket guests receive a glass of champagne or soft drink and priority boarding. When purchased online, it is $32 for adults and $27 for children age 4 to 12. When purchased on the day, it is $39 for adults and $34 for children. 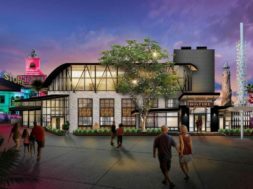 Guests also have the option to purchase a combination ticket to see one, or both, of the other two attractions at I-Drive 360: Madame Tussauds and SEA LIFE. Orlando Eye + SEA LIFE *or* Madame Tussauds: $29 for adults and $24 for children age 4 to 12, when purchased online. Add $10 per ticket if purchasing on the day of your visit. 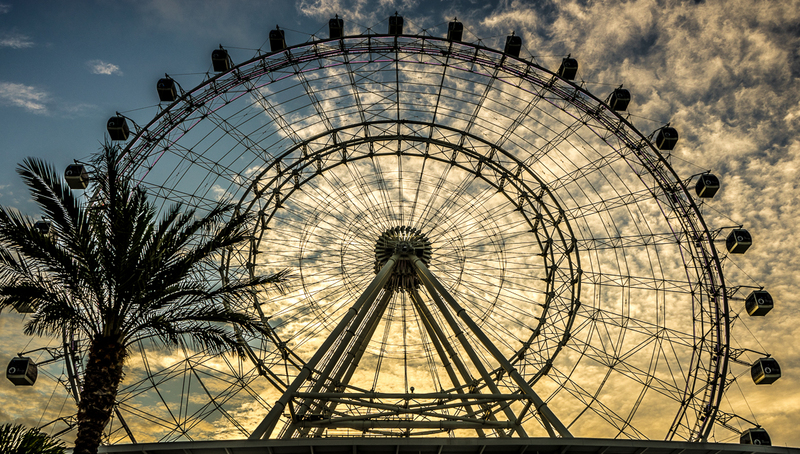 Orlando Eye + SEA LIFE *and* Madame Tussauds: $35 for adults and $30 for children age 4 to 12, when purchased online. 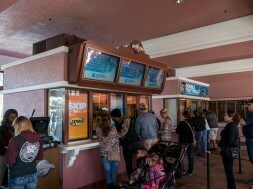 Add $14 per ticket if purchasing on the day of your visit. 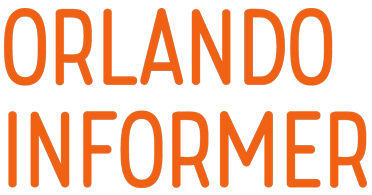 Finally, guests can purchase a ticket that includes The Orlando Eye, SEA LIFE, Madame Tussauds, and Legoland Florida. This ticket costs $89 for adults and $84 for children, if purchased online. Please note that Legoland is not at I-Drive 360 and will require a free shuttle service. Your Legoland ticket is valid for 30 days after your visit. 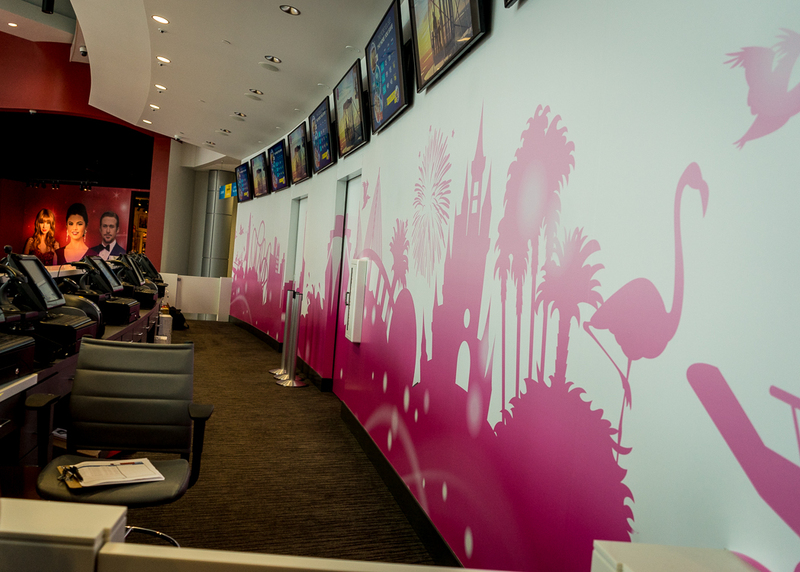 The ticket counter for The Orlando Eye. 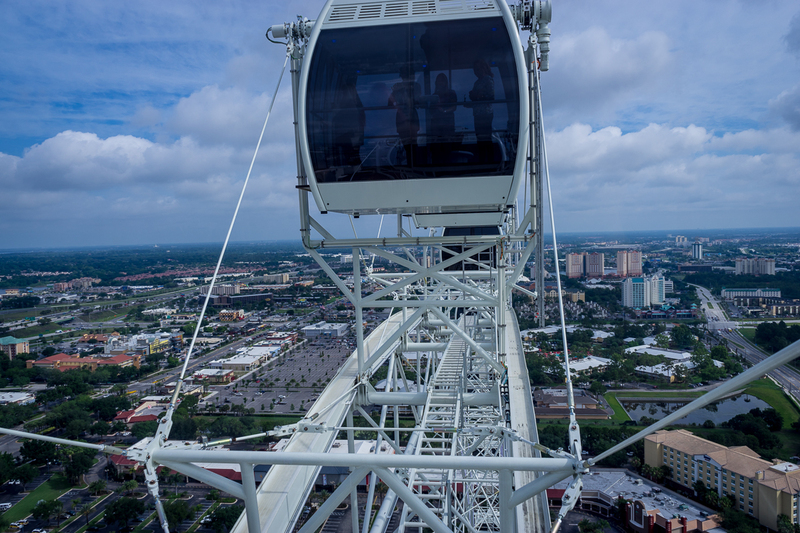 Before taking flight 400-feet above Orlando, you’ll have two stops. The first of which is to get your photo taken with your family or group. These photos are taken in front of a green screen, with the backdrop added while you are riding. Following your ride, the photos are available for purchase. One of the more nifty options is for a photo book that contains information about the sights you saw on The Orlando Eye and the pictures you took before riding added into it ($35 + tax). It comes with a digital download card, although these are available separately as well. The final step before boarding is a 4-minute 4D video. 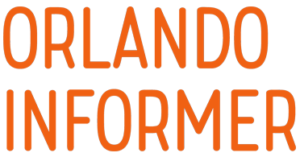 You will be given glasses to wear during this short show that features sights and sounds from almost everything there is to see in Central Florida. 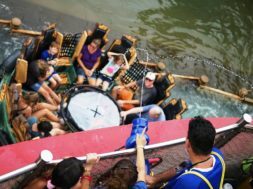 From SeaWorld to Universal’s Diagon Alley, you will see it all in this neat experience to whet your appetite. After all that, it will be your time to fly. You will board The Eye as it moves slowly. If you have a disability that prohibits you from boarding while the wheel is in motion, make sure you let an employee know so that they can accommodate you. 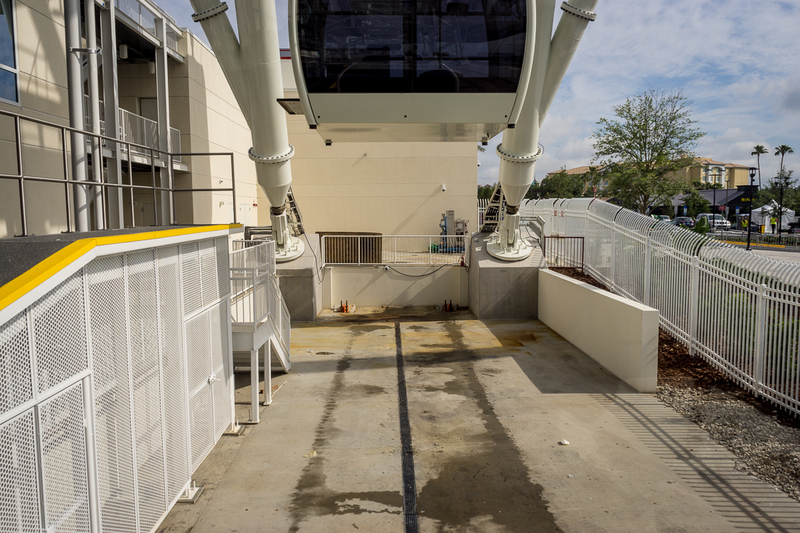 The Orlando Eye boarding station. The flight from start to finish lasts about 20 minutes. On a clear day you’ll be able to see as far away as Cape Canaveral. 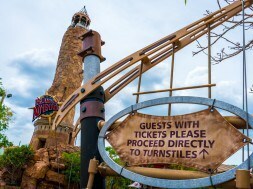 Other sights you can see from the attraction include Universal Orlando, Disney World, Fun Spot, and Downtown Orlando. Over the course of your ride, there will be narration and ambient music. The narrator supplies details of some of the sights you’re seeing and shares a few facts about the ride. Each capsule holds up to 15 guests and includes air conditioning. 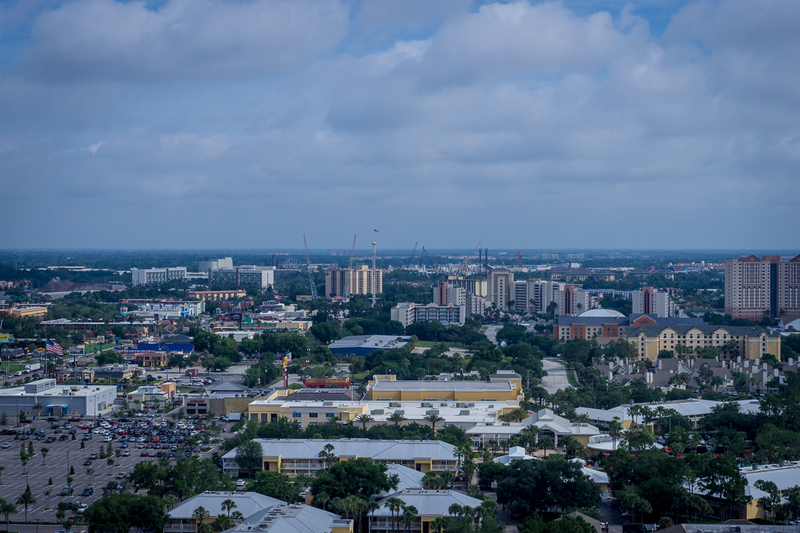 Universal Orlando and Fun Spot in the distance. The top of The Orlando Eye. 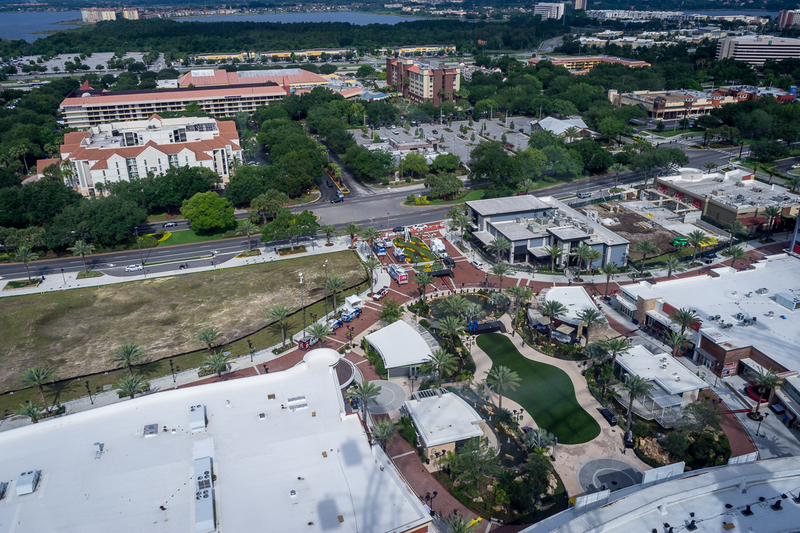 I-Drive 360 plaza from above. 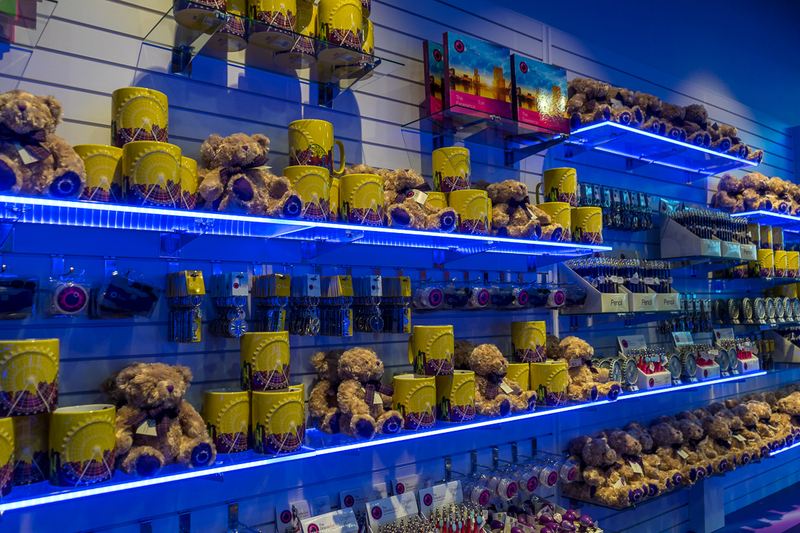 The Orlando Eye exits into a gift shop, like most attractions in Orlando. 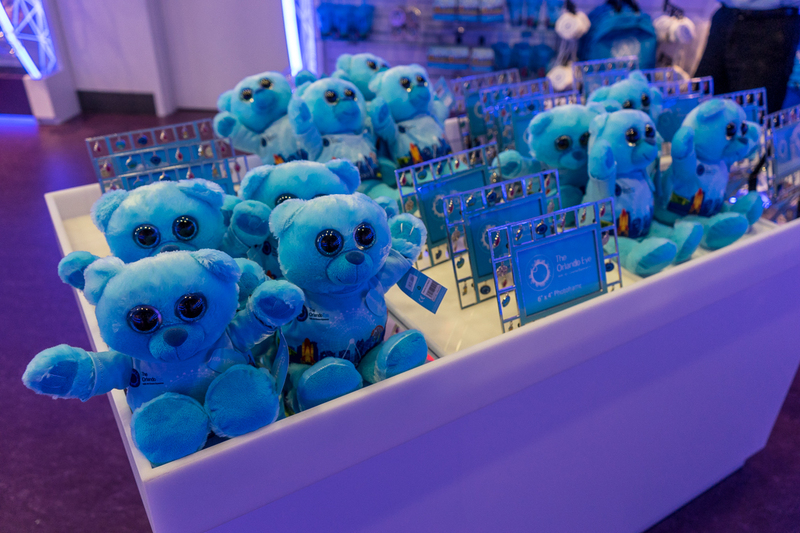 The gift shop is filled to the brim with unique merchandise themed to the observation wheel and Orlando in general. Have a question? Take a look at our FAQ below. If your question is not answered, post it in the comments below and we’ll do our best to answer it. 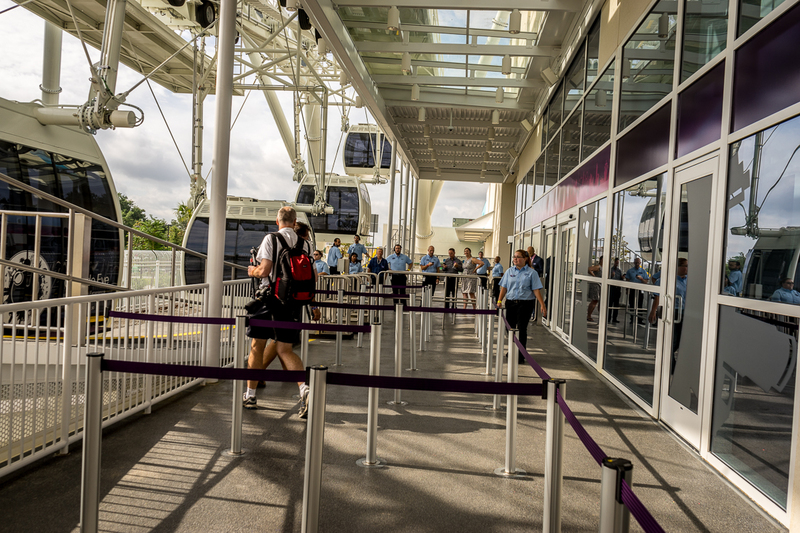 You can also head over to our full gallery of The Orlando Eye, if you want to see more pictures from our experience. What can I bring on the ride? Your bags will be checked prior to boarding. Items not permitted include: sharp objects (pocket knives), guns, pepper spray, alcohol, and tripods. For a full list of prohibited items, head on over to this page. I have a disability that requires me to stay in a wheelchair or have oxygen, can I still ride? Yes, check out our latest “Special Needs are Universal” article being published this afternoon for more information. 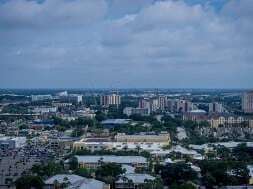 How long will The Orlando Eye take from start to finish? The complete experience from parking to leaving will probably take somewhere around an hour. You are asked to arrive in line 15 minutes prior to your boarding time, if you have purchased your ticket in advance. Is there anywhere to sit inside the capsule? Yes, there’s a small circular bench that will fit about 5 guests at one time. If you’ve already rode The Eye, make sure to share your thoughts in the comments below!